On Wednesday, February 22, 2017, His Excellency Cosmos Richardson, Saint Lucia’s new permanent representative to the United Nations, presented his credentials to UN Secretary-General António Guterres, at the United Nations Headquarters in New York City. 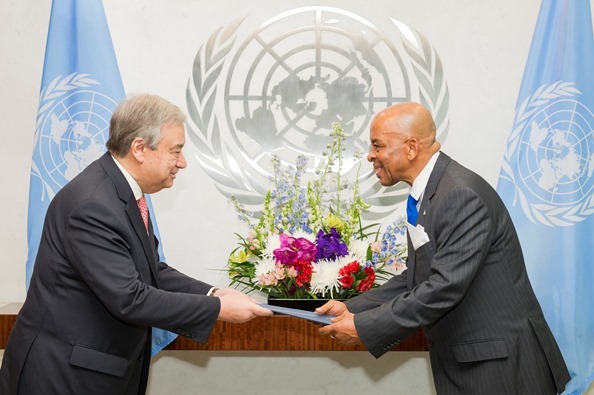 In presenting his Letters of Credence to Secretary General Guterres, His Excellency Cosmos Richardson stated his intention to work closely with the UN Secretariat, its various agencies, and its membership. He also pledged to advance the organization’s goals, while ensuring that Saint Lucia’s interests are protected and promoted. Further, Ambassador Richardson used his discussion with Secretary-General Guterres to highlight a few of the issues that most concern Saint Lucia, and the priorities of its people within the United Nations context. Chief among them are climate change, security, the successful implementation of the sustainable development goals, international development cooperation, youth development and unemployment. Ambassador Richardson also struck a note of national pride, reiterating that his official accreditation to the United Nations occurred on the very day that Saint Lucians at home and abroad were commemorating the island’s thirty-eighth year of independence. A retired civil servant with more than three decades of service to the Government of Saint Lucia, Ambassador Richardson has held a number of key government positions. Most recently, he served as Saint Lucia’s Ambassador to CARICOM and the OECS. From 2007 to 2012 he was Cabinet Secretary and Permanent Secretary in the Office of the Prime Minister. Prior to that, he served as Permanent Secretary in the Ministry of External Affairs, International Trade and Civil Aviation, and Permanent Secretary in the Ministry of Commerce, International Trade, Investment, Enterprise Development and Consumer Affairs. From 1986 to 1997, he served in the Ministry of Agriculture, Fisheries, Physical Planning, Natural Resources, and Co-operatives. Until his diplomatic appointments, Ambassador Richardson also provided consultancy services for various organizations in the areas of public policy, policy analysis, and strategic planning. A graduate of St Mary’s College and the University of the West Indies, Ambassador Richardson holds a master’s and a bachelor’s degree in Economics, as well as a post-graduate diploma in Agricultural and Natural Resource Economics. Ambassador Richardson succeeds Menissa Rambally, who served as Saint Lucia’s Permanent Representative to the UN from May 2012 to December 2016.